Katjavivi, P. 2015. Namibia decentralisation and the Parliamentary oversight process. GREAT insights Magazine, Volume 4, Issue 4. June/July 2015. The Namibia National Assembly is actively engaged in the process of consolidating the role of Parliament in Namibia in the task of taking the Parliament to the people and in participatory development involving grassroots communities, i.e., strengthening the voice of the people. Also, the Parliament adopted the National Budget early this year and later executed informative workshops dedicated to empowering Parliamentarians on the details of the Development Budget. 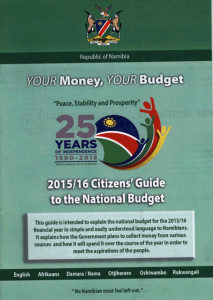 We ensured that a simplified version of the budget was made available as a small 19 page booklet in all the local languages spoken in Namibia and furthermore, we have also embarked on an ambitious programme of digitising the Development Budget. 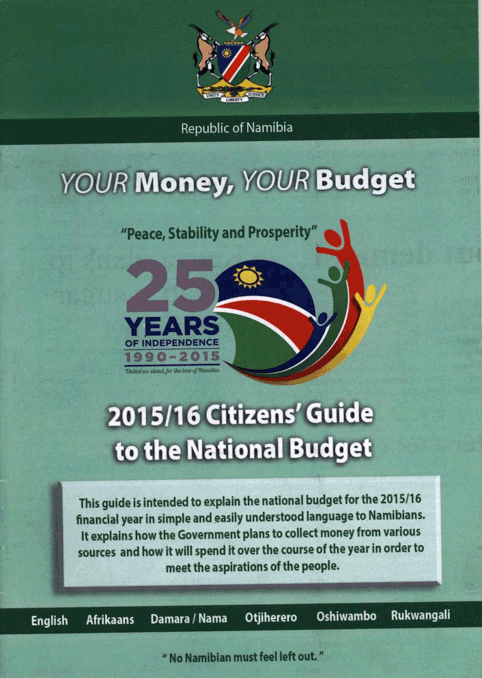 These initiatives in themselves have several advantages: they have helped strengthen the oversight responsibility for both the government side as well as the opposition; many more citizens are now able to access and understand the details in the Development Budget unlike when only huge bulky complicated and limited books were being published to reflect the development budget; and there is more transparency and accountability within the budget implementation process. This has brought along a host of other benefits. For instance, previously, the country witnessed a lot of overspending and underspending, with a lot of funds being returned to the Treasury by ministries and agencies which ironically had not accomplished all their programmes as budgeted for. Better oversight is discouraging this practice and, furthermore, it has curbed the habit of moving project funds to other projects without consulting the primary intended beneficiaries. This has meant that implementers stick to the motivated budget programmes and projects unless there is a critical need for shifting them, in which case, necessary consultation has to be undertaken with the intended beneficiaries. We would also like to strengthen our capacity for networking with sister parliaments in Africa and beyond and furthermore, to deepen the involvement of women and youth in the crafting of national legislations and policies. For example, Namibia’s experience with the Child Care and Protection Bill, which was eventually passed as an Act of Parliament, provided a good learning curve. In this context, efforts are under way to accelerate the implementation of integrated early childhood development programmes as planned within our Fourth National Development Plan (NDP4). The country’s First Lady has agreed to become a Patron for the implementation of Early Childhood Development programmes. Of importance is also the fact that we are pursuing continued child participation through children’s Parliament while looking forward to leaning more on child-focused analysis of the budget in collaboration with our partners and South-South cooperation. Namibia being a host country to the SADC Parliamentary Forum (SADC-PF), I as the Speaker of the National Assembly, form part of the leadership that is expected to play an active role in the process of transforming the SADC-PF into a SADC Regional Assembly. Obviously, the quest for strengthening regional integration and a greater sense of unity is key to the economic empowerment of the continent and our various national economies and peoples’ welfare. This will also go a long way towards enhancing cross border cooperation on matters relating to security, cultures and economic welfare. Now more than ever, there is a need for market creation for the products of our various infant industries. These issues have to be managed beyond national boundaries. We would like to build the unity of the Regional Assembly around issues of common values, for example, the crafting of model laws so that citizens can realise the direct impact of the dynamics in the region. Other obligations of the SADC Regional Assembly will include infrastructure development, areas of common interest and bench-marking interventions that could be shared across state boundaries. Currently, arrangements are underway to engage leaders within the SADC Region over the matter, before the Regional Summit in August 2015. 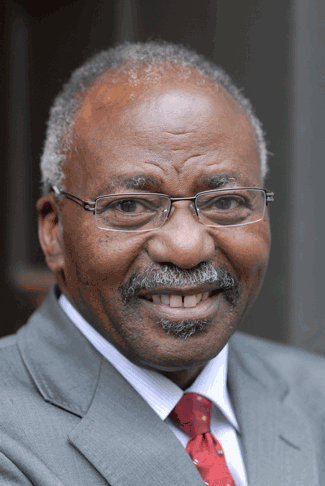 The Honourable Professor Peter H. Katjavivi, MP, Speaker of the National Assembly of Namibia (and former Board Member of ECDPM). 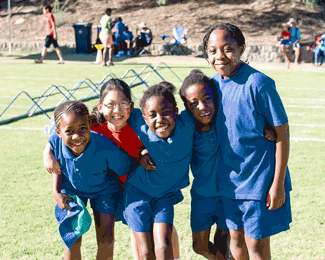 Photo: Young girls at a sporting event at St. Paul’s College, windhoek. Credits: Philip Schuler / World Bank.